And We Stay was my first official read of 2014 and was kind of an impulse request on my part; I wasn’t expecting much but guys, I really, really liked this book. It tells the story of a teenage girl left to pick up the pieces when her boyfriend kills himself in a school shooting he is the perpetrator of. Sent away to a boarding school hundreds of miles away, Emily begins to express her grief and the secrets that burden through poetry, which is interspersed through the novel. I was kind of surprised at how much this book got to me tbh but I have to say that Emily’s relationship with her boyfriend felt vividly real to me. 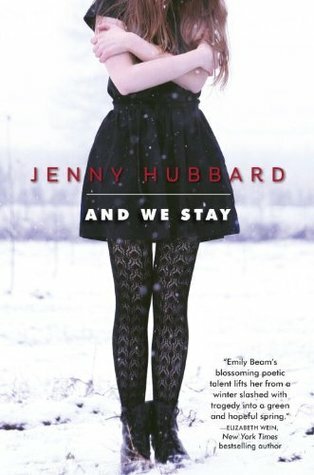 The author writes this incredibly honest, stark depiction of teenage love – the first flurry of emotion, the belief that they’ll be together forever, the moment where everything crashes to the floor…Hubbard is so, so good at writing about the layers found in these relationships. I really loved, or rather, identified, with Emily’s immense guilt over the circumstances surrounding Paul’s death as well as the resentment she hides deep down for being made to feel guilty. It was just a really interesting take on the overly romanticised ideal that you’d die for each other – Paul takes his own life but as we see in the novel, Emily spends a very long time coming to terms with the fact that she didn’t love him enough to be who he needed. I think what this book is really good at discussing is the pressure put on teenage girls in relationships – that is their burden to bear to keep their boyfriends happy. With Emily we see the most extreme reaction – ‘if you don’t love me any more I’ll kill myself.’ And what I really love about the way the author writes Paul and Emily’s relationship is that, ultimately, it turns into a question of whether Emily loves Paul or herself more. Hubbard writes with sensitivity, always being careful to never blame or pass judgement on her characters’. Emily and Paul’s relationship may be the most important one in the novel but every other relationship has an equal level of complexity. For example, Emily’s parents are overbearing and intimidating, making decisions on behalf of their daughter without ever consulting her, and in a lot of books this would place them in a negative light but Hubbard isn’t interested in placing her characters in boxes. Instead we see Emily angry at her parents but still loving them for loving her; in a moment when Emily is left to grieve what she’s lost, she realises that even though it should have been her decision, she would have still have made the same one as her mother did on behalf of her. I want to also talk about the prose and the poetry in this novel. Hubbard can write like few others can tbh. Emily Beam, our protagonist, identifies strongly with Emily Dickinson and it plays an important role in how the novel evolves. Emily is a reticent character who, because of what she’s been through, retreats even more inwardly and only ever releases her true emotions in her poetry. The poetry never feels superfluous; indeed, it is impossible to understand the deeper emotional layers of the book without understanding the poems Emily writes. Some are bad, some are angry, and some are so tragic that it’s hard not to cry (‘Seed’ legit made me sob) when reading the words. Hubbard creates a connection between her fictional Emily and the real Emily Dickinson because the two parallel each other, a fact that Emily notices. Emily Dickinson’s poetry was published posthumously; for most of her life she hid herself away, and fictional Emily sees that she does the same. I actually really liked the inclusion of Dickinson because early on, Emily mentions seeing a therapist and that it never helped her. But words do; the poetry of a woman long since dead reaches Emily when no-one else can, and in a lot of ways I can understand that. Sometimes talking doesn’t help at all, but reading can. I’m basically rambling now but I want to mention the other things I loved most about this novel; the emphasis on female friendship was wonderful, and Emily’s growth as a character was just fantastic. I’m so glad that I kicked off the year with this book because what a great start tbh. And We Stay sounds like an extremely moving novel. I’ll keep my eye out for it. Thanks for the review. I have this book on my TBR list but after reading your review, I am definitely making it a point to read this sooner! You have to really be a solid writer to take a topic like this one and make it central to Emily and her development and growth and emotion. It sounds fantastic! I loved And We Stay so much. I was so prepared to be disappointed because I’m not that big of a fan of verse but I was so pleasantly surprised. I loved the poems in AWS and I loved the story and I love the lack of romance.